Units with only cold water was 76.1% of all occupied housing units in the CNMI in 2017; units with both hot and cold water was 23.1%; and units with no piped water was only 0.8%. The percentage of occupied units with only cold water was higher in both Rota (84.7%) and Tinian (84.1%) and relatively lower in Saipan (75.2%). Conversely, units with both hot and cold water was relatively higher in Saipan (23.1%) and lower in Rota and Tinian (both 15.3%). 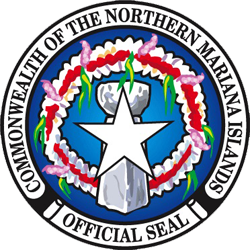 Within Saipan, units with only cold piped water percentage was highest in District 2 (83.5%) followed by District 5 (80.9%), District 1 (75.8%) and District 4 (73.8%) and then District 3 (69.9%). 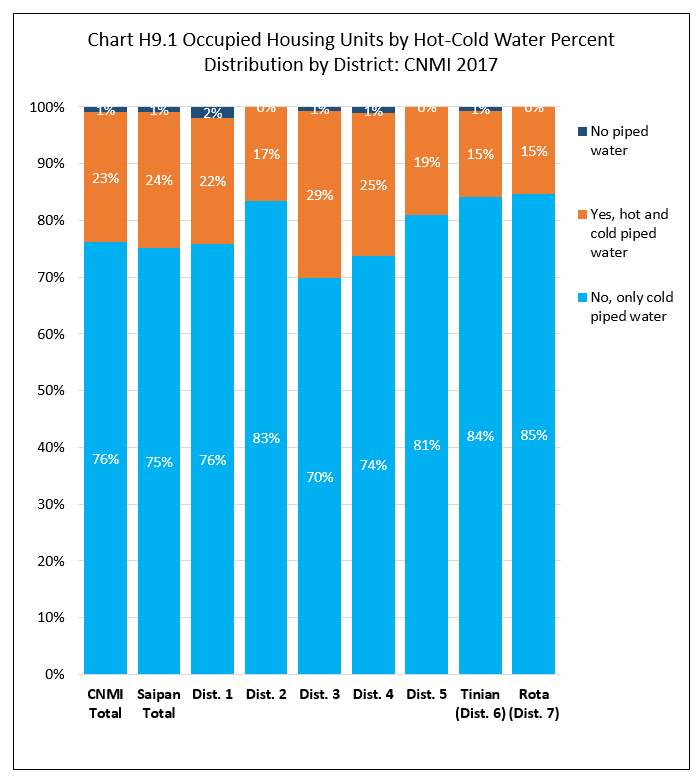 Units with both hot and cold piped water percentage was highest in District 3 (29.4%), followed by District 4 (25.0%), District 1 (22.4%), District 5 (19.1%), then District 2 (16.5%). See Chart H9.1 and Table H9.1 for detail. 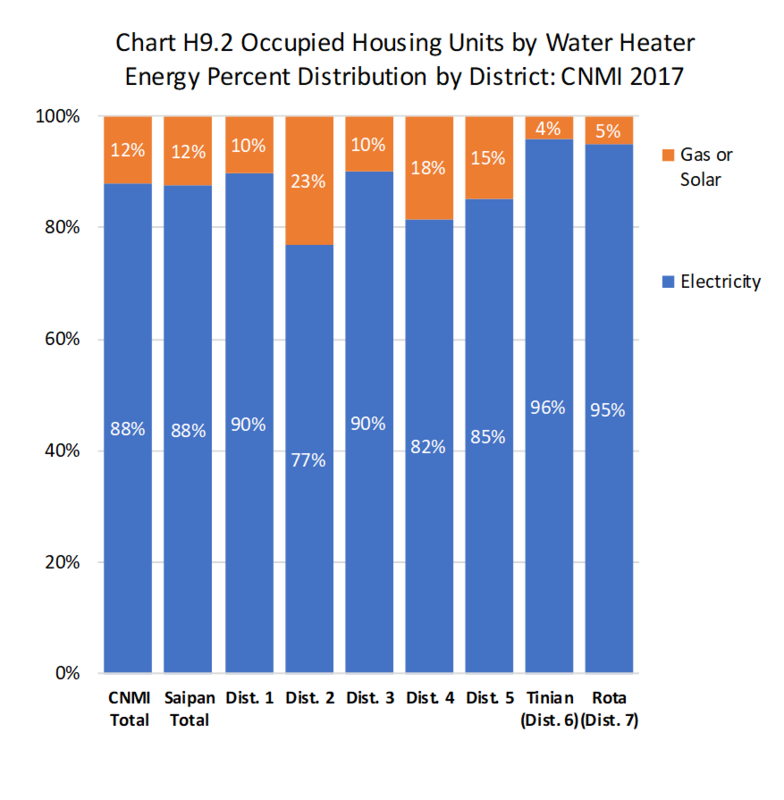 Units with electric hot water heater was 88.1% of all occupied housing units with hot water in the CNMI in 2017 while units with gas or solar water heater was 11.9%. The percentage of units with electric hot water heater was higher in Tinian (95.8%) and Rota (94.9%) and relatively lower in Saipan (87.6%). Conversely, the percentage of units with solar or gas water heater was higher in Saipan (12.4%) and lower in Rota (5.1%) and Tinian (4.2%). Within Saipan, the percentage of units with electric water heater was higher in Districts 3 (90.1%) and Districts 1 (89.8%) and was lowest in District 2 (76.8%). The percentage of occupied units with gas or solar water heater was highest in District 2 (23.2%) and lowest in Districts 3 (9.9%). See Chart H9.2 and Table H9.2 for detail. Table H9.1 Occupied Housing Units by Hot and/or Cold Water, by Island, and by District: CNMI, 2017 4th Qtr. Table H09.2 Occupied Housing Units by Water Heater Energy, by Island, and by District: CNMI, 2017 4th Qtr.